The Klinghardt Mountains are a Namibian mountain range in the Diamond Restricted Aerea, also called Sperrgebiet. The Klinghardt Mountains are located approximately 90 km south-southeast of Lüderitz and extend over an area of about 350 km2. East of the Klinghardt Mountains is the mountain Höchster. Several places of the mountain range are covered with sand which is blown over by sandstorms. 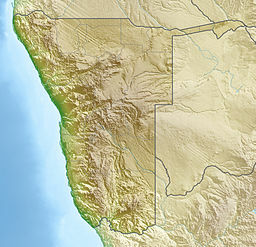 The average yearly rainfall in this area of the Namib desert amounts to just a few millimeters.